Throughout most of sub-Saharan Africa, rural women spend an inordinate amount of time and energy, every day, fetching and carrying water and firewood. 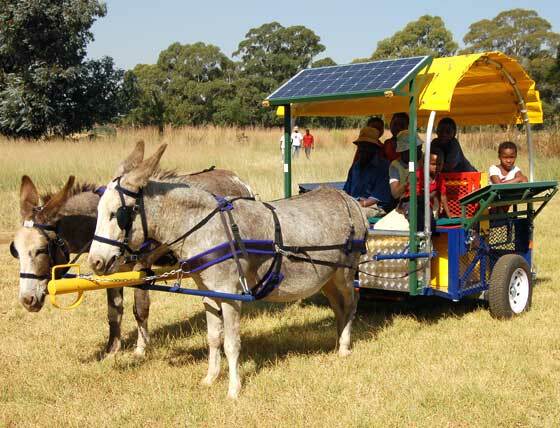 While there is little possibility of providing piped water and electricity to most rural communities in the near future, basic Human and Animal Powered Vehicles – or HAPV’s (see HAPV MODELS) – could make this task far quicker and easier. 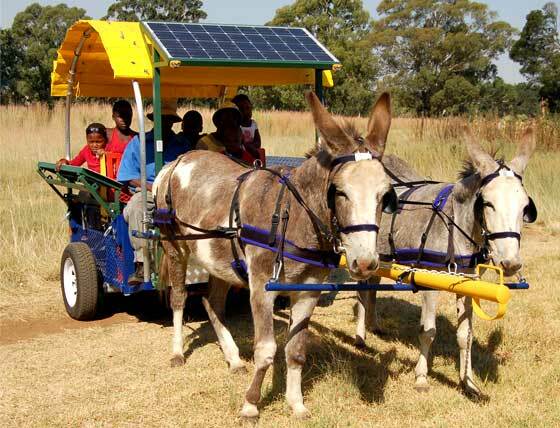 These include the water-wheel, the pannier, custom-built vehicles, or multipurpose carts such as the “HAPPY”. 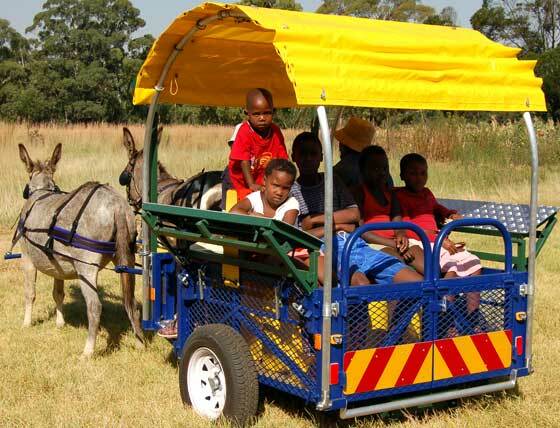 Rugged in construction and ingenious in design, the “HAPPY” is a high-tech model of an ancient, yet proven concept, the donkey cart. 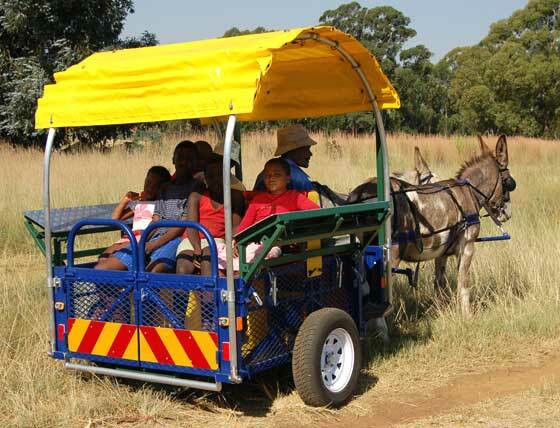 This versatile vehicle is fitted with seats to carry up to four adults, or several children. The space below the seats allows for the transportation of standardized water containers and beverage crates. When the seats are folded down they form a flatbed to carry agricultural products and wood, or a mesh cage to transport small livestock. The rear seat also serves as a ramp for easy loading, and comfortable transportation of the disabled. The sideboards can be set at an angle as safety barriers for passengers, changed horizontally into counter tops, or be detached as independent benches, that with the removable canopy, can be used as a makeshift outdoor classroom. 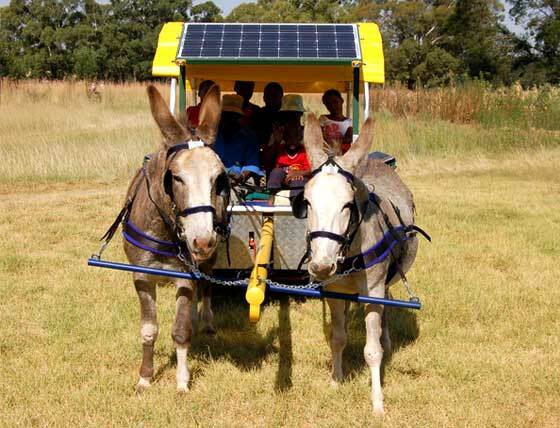 Fitted with a solar panel that charges a 12 volt battery under the driver’s seat, the “HAPPY” becomes an independent, sustainable source of energy that powers cell phone connectivity, front and rear emergency lights and a small neon tube at night. 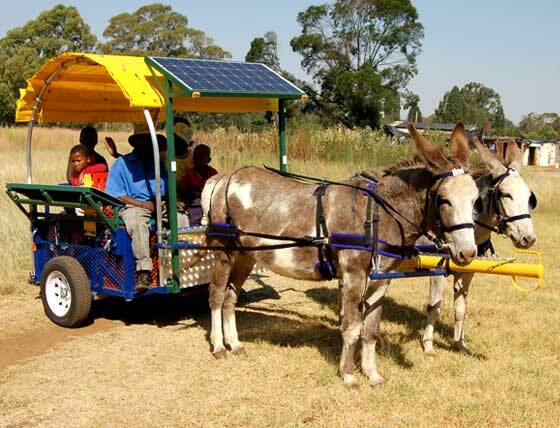 Add a water filtration system, and the “HAPPY” doubles as a multifunctional mobile business unit, that can empower an entrepreneurial owner, to generate income from it as a fresh water outlet, a mobile phone kiosk or a spaza shop – even after dark. “HAPPYS” can empower rural women; enhance their status and independence; and liberate their time for more productive activities. They can get children to school; mobilize the frail; get the sick to medical care and the elderly to collect their pensions. “HAPPYS” could even turn landmine victims into independent and economically active members of their communities. “HAPPYS” can deliver agricultural produce and crops to local markets; create new business opportunities; stimulate existing enterprise and minimize many difficulties associated with the distribution of consumer goods and life essentials in rural areas. Unfortunately “HAPPYS” cannot yet be purchased or ordered as standard items, in spite of a growing recognition of the importance of animal power in the developing world. This is why we need your help to fund Phase One of project “WHEEL & WATER” aimed at providing as many deserving South African rural communities as possible with at least one “HAPPY” each – particularly communities managed by women, children, the frail and the aged. One “HAPPY” could benefit several families in a rural community. A few thousand “HAPPY’s” could have a major effect on many more, impacting positively not only on general health, social structure and nature – but also on upliftment, self-reliance and poverty alleviation. During Phase Two, individuals designated by their rural communities will be brought to central production-training centres to be skilled in the manufacturing of their own “HAPPYS” and production management. 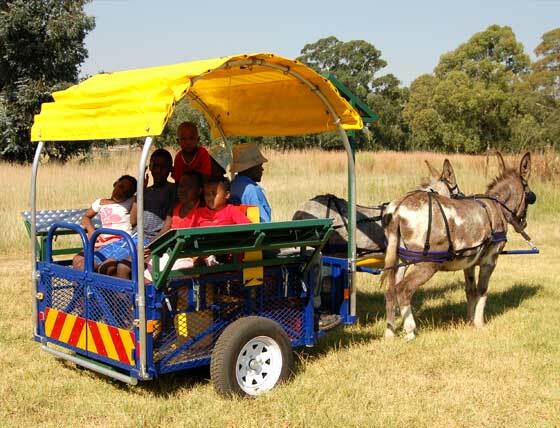 The third and final phase of project “WHEEL & WATER” will see mini-manufacturing-franchises, owned by training-centre-graduates, rolled out to rural communities to help provide urgently needed labour and employment opportunities in rural South Africa. These rural “HAPPY” manufacturing franchises would be sustained as viable commercial ventures, by combining their collective production output to fill export orders from other sub-Saharan countries. 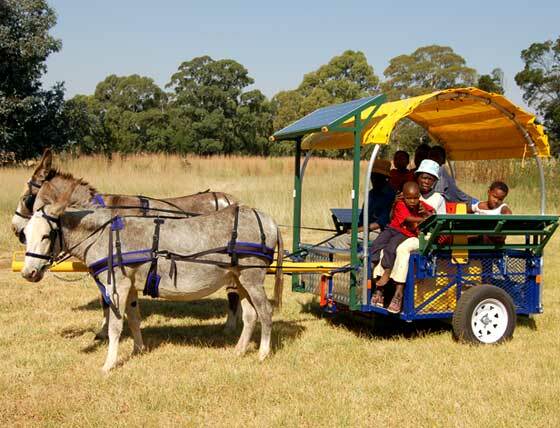 With your support, project “WHEEL & WATER” can harness Africa’s animal power to unlock Africa’s people power – and elevate rural communities to self-sufficiency.